We put together this small group resource bundle to help you build a healthy small group culture — promoting, communicating, and organizing well! Small groups have a big impact. They’re where Christian community is formed and fostered. Where people pursue the Lord and a greater understanding of His teachings and His will together. Where faith in Christ becomes integrated into everyday life and relationships. Where people are given godly encouragement and guidance. And where people come together as the body of Christ in faith, hope, and love. My last 5 years in an awesome LifeGroup have thoroughly convinced me that every seeker and believer should get plugged into a group. And that every church should empower small group leaders to foster fruitful fellowship! My small group has gotten to know me in a genuine way, supported me through major life transitions, prayed with me, built me up in faith, and has become a primary support system in my life. I’ve experienced healthy relationships that are rooted in faith with both friends generously building each other up. Two of my LifeGroup co-leaders will even be bridesmaids in my wedding this year! Community leads to life-change. We believe that groups help you grow. Thus, small groups are a key part of our growth track sequence. If you haven’t seen that, check it out here. My prayer is that every church will empower small group leaders to provide the same life-changing experience in their own communities. Small Group Leader Doc: Downloadable template to organize small group leader tasks, communications, and attendee information. Small Group Sign-In Form: Print this form to collect and organize member and visitor information. Small Group Session Template: Template to download and plug-in your small group discussion questions to create a handout. Communication Timeline: Guide and templates to community-building communications. Sample Schedules: Two proven small group schedules with tips for fellowship, content, and discussion times. Small Group Branding: Downloadable logos for your small group material. Click here to check out the whole bundle! We cannot wait to see what you do with this bundle! We would love for you to share pictures with us if you use any of these materials. Reach out if there is any way we can help — custom branding or edits, advice on implementation of the communication timeline or schedules, or tweaks to any of the template sheets. It’d be our pleasure to help! 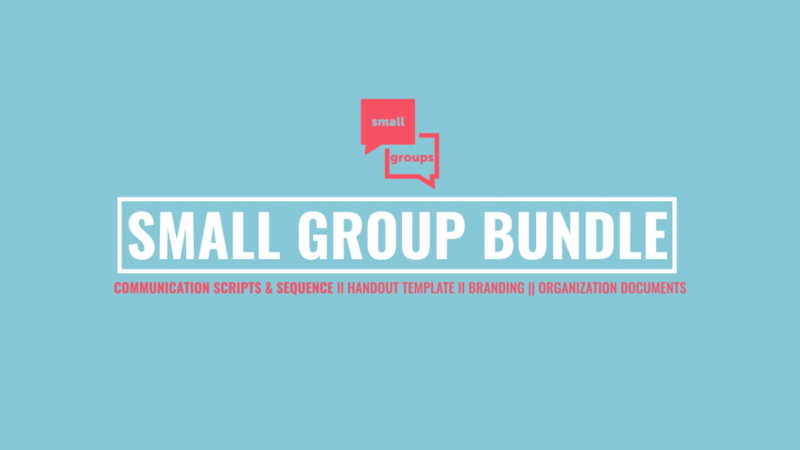 SEE THE SMALL GROUP RESOURCES BUNDLE HERE!